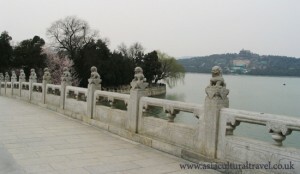 The Chinese name for the Summer Palace is “Yi He Yuan”, which means “the garden of good health and harmony” in Chinese. It covers a total area of 290 hectares, 193.4 feet of which is taken up by Longevity Hill and Kunming Lake. The Summer Palace has survived for over 800 years. 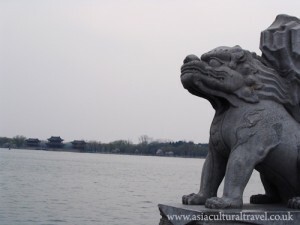 In 1153, the Jin dynasty chose Beijing (named Yanjing) as its capital, and an imperial palace, named “the Golden Hill Travelling Palace”, was built on the current site of the Summer Palace. In 1750, Emperor Qianlong of the Qing dynasty built the Garden of Clear Ripples using 4.48 million taels of silver. It took an astounding 15 years for the construction of this garden to be completed. In 1860, the Anglo-French Allied Forces invaded Beijing and burned down the palace. In 1888, Cixi, the Queen Regent, spent the 30 million taels (937,500 kilogrammes of silver) that were meant to be used developing the national navy on restoring the garden. It was Cixi who renamed this palace the Summer Palace. Unfortunately, it was plundered again in 1900 by invading troops from the Eight-Power Allied Forces (Britain, the United States, Germany, France, Tsarist Russia, Japan, Italy and Austria). The huge temple and the halls on Longevity Hill were all destroyed. The only buildings that survived were the non-wooden structures, such as the Bronze Pavilion in Baoyunge, the Marble Boat and the Sea of Wisdom Temple. But, in 1903, Cixi once again sunk plenty of money into the reconstruction of the palace. Now the Summer Palace is more or less the same as it was when it was rebuilt in 1903. The Queen Regent Cixi and her nephew, the Emperor Guangxu, dealt with state affairs and met officials in this hall. The hall was first built in 1750 and was named the Hall of Industrious Government. Although the sentiment does not translate well, the term “Industrious Government” in Chinese means “working hard on issues and concerns related to the government”. Of course this hall was so-named for the emperor, implying that he worked assiduously on government issues. There was a throne in the middle of the hall which followed the nine-dragon design. There were also two big fans made of peacock feathers on either side of the throne. The inscription on the tablet in the altar states that if the emperor employs great benevolence when managing the government then he will live a long life. There is a pair of wooden lions in the hall that were carved from the roots of two birch trees. There is also a wooden elephant there, which was considered a symbol of universal peace. Around the throne are placed tripods and lamps in the shapes of phoenixes and cranes. Candles, sandalwood and incense were burned inside of these lamps to heighten the mystical atmosphere of the hall. According to the original plan, a nine–storey tower was built in the Garden of Clear Ripples by Emperor Qianlong of the Qing Dynasty. The tower was designed after the famous tower in Hangzhou – Liuhe tower. But not long after finishing the eighth storey of the tower, some of the architects argued that this tall, thin building did not suit the surrounding hills and the lake. They thought a more imposing structure would be more suitable. Emperor Qianlong accepted their argument and so the Tower of Buddhist Incense was built instead. 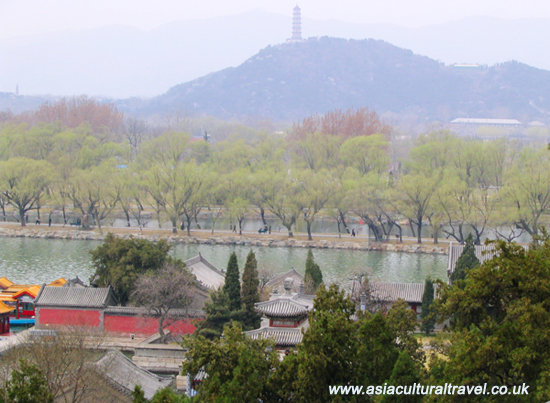 When you come to the Summer Palace nowadays, you will find a three-storey tower, which is 41 metres high. This is the Tower of Buddhist Incense. The Queen Regent Cixi used to worship the Gods here. It was rebuilt twice: first in 1860 after it was destroyed by the Anglo-French Allied Force and then again in 1900 after it was destroyed by the Eight-Power Allied Force. This bridge is on Kunming Lake and provides passage to Penglai Island (South Lake Island), which is where you will find the Temple of the Dragon King. The bridge is 150 meters long. From a distance, it looks like a rainbow hanging across the river. There are 544 carved stone lions on the bridge, all of them in various different poses. It’s a lot of fun just looking at the diversity of appearance among the lions on the bridge. What’s more, if you visit the Summer Palace during the spring, you will be treated to what is considered its most beautiful view. 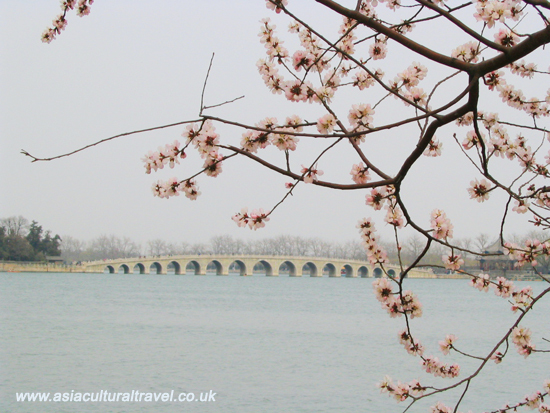 There are hundreds of peach trees in the park, all along the edge of Kunming Lake. In the spring, when the peach trees blossom, the view from across the lake is breathtakingly beautiful.